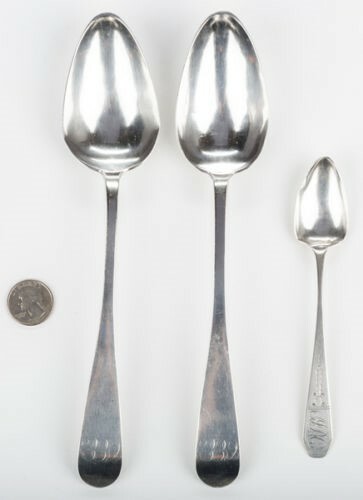 The Historic Shepherdstown Museum recently acquired some silver spoons that were made by a Shepherdstown artisan some 200 years ago. 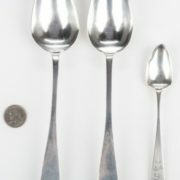 Raw metals in the early 1800s were difficult to come by and any silver that was used most likely came from silver coins, which were melted down and molded into the desired shape –spoon, fork or even a diner plate or charger. The term “coin silver” refers to silver that’s been mixed with about 10 percent copper to give it extra strength. The museum’s new acquisitions were made by John Bernard Woltz. If you’ve visited the museum, this name may perhaps sound familiar. The tall-case clock in the front parlor was made by the same John Bernard Woltz. Huh? Clocks and cutlery? The museum also has on display several silver spoons made by Frederick Posey, likewise a silversmith, watch and clockmaker, who lived at the Entler Hotel for a time. Oh, and what about the cavities? Eric Jenkins says that there were several clock makers in Martinsburg who not only made clocks and silver but, because they worked with gold, also made gold crowns and fillings. Stop by the museum and see the Woltz and Craft clocks, as well as the museum’s collection of silverware made by early Jefferson County craftsmen. http://historicshepherdstown.com/wp-content/uploads/2018/04/woltz-spoons.jpg 500 363 bts4hsm http://historicshepherdstown.com/wp-content/uploads/2015/12/hsc_logo_dummy.png bts4hsm2018-04-16 13:38:052018-04-16 13:38:05Coins, Clocks, and…Cavities?